Watch out. 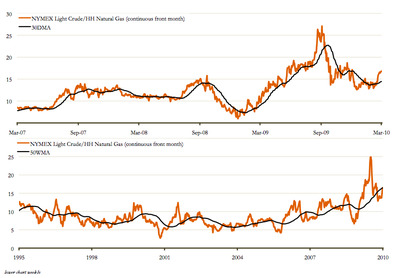 As noted by Waverly Advisors, The historical ratio between oil and natural gas is getting out of whack again, suggesting — if you believe that there should be some connection between two arguably substitutable hydrocarbons — then you’d expect natural gas to rally and the ratio to close. Of course, you’re looking at 2009 when the ratio soared. However that was a weird period resulting from an uber-weak dollar, and a unique situation in the natural gas market. Presuming a more normal period, such as what we saw prior to Sep 2008, it would appear that it’s time for nautural gas to rally (at least relative to oil).